As a member of the toy breeds, the Miniature Pinscher is often referred to as 'King of the Toys'. Moonracer is a clever name idea borrowed from the lion that is king of the misfit toys in the classic christmas movie 'Rudolph the Red-Nosed Reindeer'. Other king-related names include Louis, Tut, and Darius. 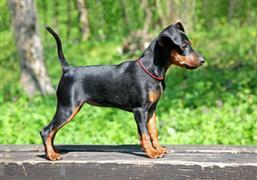 Coming from Germany, The Miniature Pinscher is often given a name of German origins. A few of the most popular ideas include Klaus, Freda, and Kaiser. The breed has been described as a small dog with a big dog mentality. Inspirational names from underdogs with big accomplishments are Samson, Rocky, and Rudy. Their small size and active nature has caused many Min Pin owners to come home to an empty backyard. The breed's escape-artist tendencies require extra thought and fine-tuning of boundaries. Houdini, Copperfield, and Angel are some magician themed ideas derived from the characteristic inclination to escape. Some of our pages will contain a subcategory. A subcategory is a slightly more specific grouping than the main topic of the page. For a subcategory, we will include a separated table of names and corresponding descriptions. An example of a subcategory of Red Dog Names would be 'Dog Names Inspired by Red Wines'. If you have any subcategory ideas for the Miniature Pinscher Names page, we would love to hear them. Use the form below to submit your ideas.